Buy this greenhouse today from Greenhouse Warehouse and get a Free 4ft Wooden Staging Bench worth £45.00. Just add the Staging to your Basket and enter Discount Code STAGING at the Checkout. 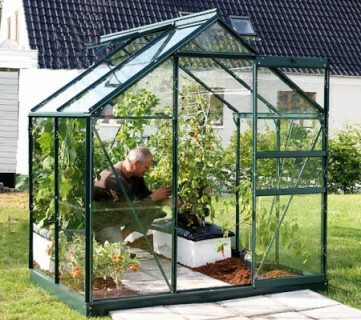 This Vitavia Venus 2500 greenhouse is relatively simple to construct using the comprehensive instructions which have excellent illustrations. Fast UK customer support is available should you have any problems. This greenhouse is supplied as a self-assembly product. All heights exclude the optional 125mm Galvanised Steel Base. If you choose not to have this base, you will need to supply a raised strip of timber, metal or brick beneath the aluminium framework, to accomodate the lips of the lowest profiles. Glazing - Horticultural Glass is the standard glazing material used for glazing greenhouses, although many customers now choose to have Long Pane Toughened Glass which is about 8x stronger, and comes in large panes so there are no overlaps (this also looks nicer). Toughened Glass is very strong and shatters into tiny fragments rather than dangerous shards like Horticultural Glass. 4mm Twinwall Polycarbonate is very strong, virtually unbreakable, and therefore ideal where children are around. However polycarbonate is lightweight and not as rigid as glass, so we don't recommend using this in exposed locations because the panels can get dislodged in windy conditions. Anodised aluminium surfaces are harder than normal aluminium and have increased resistance to corrosion and wear, which means that your Vitavia Venus 2500 greenhouse will retain its appearance for many years. Green frames are exactly the same anodised aluminium frame which is then coated with a durable green powdercoat which won't ever flake or chip off. Delivery - This greenhouse is delivered to you within 10-14 days of your order, by specialist transport. Delivery is FREE of charge to mainland England, Wales and Southern Scotland. There may be a surcharge for delivery to the following areas; Northern Ireland, Scottish Highlands and Offshore Islands - please email or call us for a delivery price, on 01749 600014. Warranty - Your Vitavia greenhouse frame will be guaranteed for 10 years against corrosion. In practice the frame will last many, many years more. Wooden Folding Greenhouse Staging - 4ft x 14"